Gunter d'Alquen - Nazi Germany World War 2 Section. Gunter d'Alquen was Chief Editor of the SS weekly, Das Schwarze Korps. 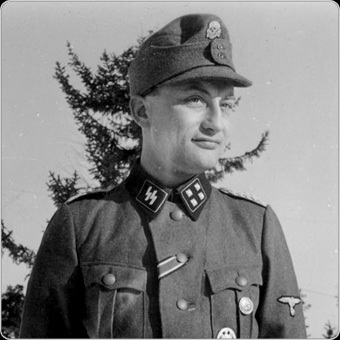 Gunter d'Alquen (October 24, 1910 - May 15, 1998) was Chief Editor of the SS weekly, Das Schwarze Korps ("The Black Corps"), and commander of the SS-Standarte Kurt Eggers. Gunter d'Alquen was born in Essen, the son of a Protestant merchant and reserve officer. After attending secondary school in Essen and joining the Hitler Youth in 1925, d'Alquen entered the NSDAP at the age of seventeen and was an SA man and Youth Leader in the Party between 1927 and 1931. He played an active part in the National Socialist Students' Association and later joined the SS on April 10, 1931, becoming an SS Captain within three years. D'Alquen never completed his university studies, concentrating instead on a journalistic career. In 1932 he joined the staff of the Völkischer Beobachter as a political correspondent, catching the eye of Heinrich Himmler who in March 1935 appointed him editor of the official SS paper, Das Schwarze Korps. As the mouthpiece of revolutionary Nazism and chief spokesman of the SS in the German press, d'Alquen's paper frequently attacked intellectuals, students, distinguished scientists, recalcitrant business firms, black marketers, churchmen and other groups or trends in German society which had aroused Himmler's wrath. Apart from its notorious antisemitism and censorious role in national affairs, the paper saw itself as a bastion of German morale during World War II, concentrating its attention on German victories at the front. D'Alquen himself became a prominent SS war reporter after September 1939 and towards the end of the war was appointed by Himmler as head of the Wehrmacht propaganda department. Among his publications was an official history of the SS, Die SS. Geschichte, Aufgabe und Organisation der Schutzstaffeln der NSDAP (1939). He also edited Das ist der Sieg (1940) and Waffen-SS im Westen (1941). In July 1955 d'Alquen was fined DM 60,000 by a Berlin Denazification court, deprived of all civic rights for three years and debarred from drawing an allowance or pension from public funds. He was found guilty of having played an important role in the Third Reich, of war propaganda, incitement against the churches, the Jews and foreign countries, and incitement to murder. He had glorified the SS State and Hitler's infallibility, brought democracy into contempt and encouraged anti-Semitism. After a further investigation into his earnings from Nazi propaganda, d'Alquen was fined another DM 28,000 by the Berlin Denazification court on January 7, 1958.